Pittsburgh is the "City of Bridges," and what remarkable bridges they are! The area's challenging topography of deep ravines and mighty rivers—the Monongahela, Allegheny, and Ohio—set the stage for engineers, architects, and contractors to conquer the terrain with a variety of distinctive spans. Many were designed to be beautiful as well as functional. While other cities may have one signature bridge, Pittsburgh has such a wide variety that no single bridge can represent it. 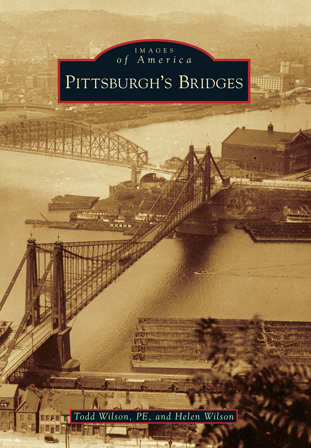 Pittsburgh's Bridges takes a comprehensive look at the design, construction, and, sometimes, demolition of the bridges that shaped Pittsburgh, ranging from the covered bridges of yesterday to those that define the skyline today. Todd Wilson is an award-winning professional engineer in Pittsburgh who has been photographing and writing about bridges his whole life. He graduated from Carnegie Mellon University with a double major in civil engineering and engineering and public policy. He serves as a trustee of Pittsburgh History & Landmarks Foundation. Helen Wilson, a graduate of Carlow University, worked as a teacher, editor, and writer for the Pittsburgh Public Schools. She is a historical researcher and writer and vice president of the Squirrel Hill Historical Society in Pittsburgh.